Includes full size patterns, full size placement sheets and instructions. 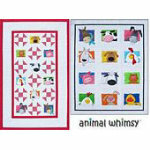 Creates a wonderful and whimsy quilt measuring 60.5" x 96.5" and an equally great wall hanging measuring 42" x 54". The technique to make the animal blocks is fusible applique.